We are setting sail on 1st July on a 6 year circumnavigation, taking in Australia, South East Asia, Indian Ocean, Africa, South Atlantic, Brazil, Northern Europe, Mediterranean, Caribbean, South Pacific. 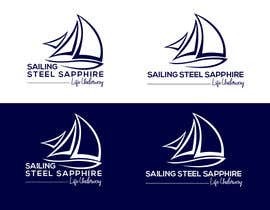 Our yacht is a custom designed 50' steel ketch called "Steel Sapphire", with a navy blue hull - she's beautiful. We're going to be maintaining a blog at [login to view URL], as well as Instagram and Facebook pages, and ultimately probably a vlog as well, and we need a really beautiful logo to help establish our brand. You can check out our instagram page at [login to view URL] to get more of a sense of the boat and our vibe. I'm currently building the website in Squarespace but obviously will need the logo for that. [login to view URL] (wordmark with cool typography above the banner, awesome logo below the banner). 1.) 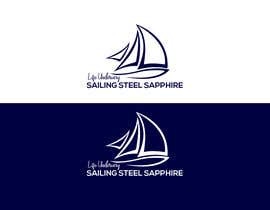 Our brand name: "Sailing Steel Sapphire" - this may be contained within the graphical element of the logo itself, or may be a wordmark locked up with the graphical element in an interesting typeface. 2.) Our tag-line/slogan: "Life Underway"
3.) One or more of the following visual elements: Silhouette of a ketch**, waves, the globe, ships wheel, compass. ** A ketch is a visually distinctive type of sailing yacht, in that it has two masts (the front one taller than the rear one), and thus flies at least three sails, rather than the more typical two. 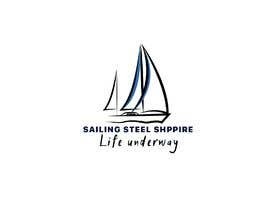 You should search google images for "Ketch Yacht" to see examples, and I will also upload some pictures of our actual yacht, "Steel Sapphire" as part of this brief. 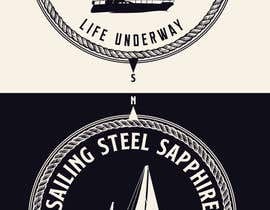 Note that if you are using a silhouette of a ketch, or just the three sails motif, it should ideally be pointing to the right. In terms of typography, the vibe we're aiming for is "relaxed, curious, open-minded, adventurous, fun", but also more focused than carefree or hippy. One of the defining features of our boat is its navy-coloured hull - it's definitely unusual, and should form a key part of our colour scheme. Secondary colours should either be Cream and Tan (hence Navy/Cream/Tan in approximately 60/30/10 ratio), or Gold (and thus Navy/gold in a 80/20 ratio). 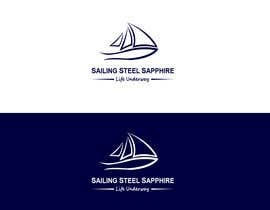 - Boat Card (like a business card, you give to other cruisers) - this will end up very much in the same visual space as the logo. - Boat Stamp - this is an offical inkstamp that you need to clear customs and immigration when you enter other countries by sea - this will be a more formal piece of design, pared back for official purposes, but likely to borrow some visual elements from the logo. Hello CH Check entry #94 . If you requirement any changes or modifications than please let me know. & the design available in fully hd, editable & scalable layered vector PNG with transparent background. Any feedback will be highly appreciated. Thanks...! Dear CH, kindly check entry #102. Hope you like my concept. If you any kind change kindly feedback or contact me, Thanks. Dear CH, Please kindly check entry #98, #99, Thanks. Please kindly check entry #96, #95, #94 , #93. Hope you like my concept, Thanks. Dear CH, kindly check entry #28, #29, #30. Hope you like my concept. If you any kind change kindly feedback or contact me, Thanks.